DRIVING to STRADDIE from the Mainland. The address where you catch the water taxi on the Mainland side is 12 Emmett Drive in Cleveland and that is where you will find the Stradbroke Ferries water taxi as shown below in the photos. 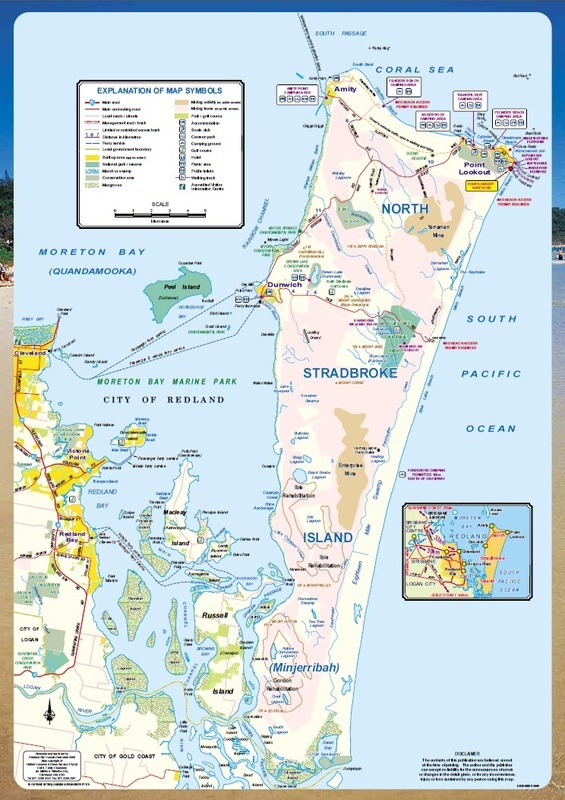 This is point we leave the Mainland to go to Straddie. We ask you to catch the 8.55am water taxi from Cleveland! We will meet you when you get to Straddie 25 minutes later at 9.20am. Catch the train to Cleveland. The 258 bus you need to catch. If you are coming from Brisbane take the train from Central or Roma Street station to Cleveland and when the train arrives in Cleveland you simply walk to the right of the train station exit and you will see the bus stop where the 258 bus will be waiting. 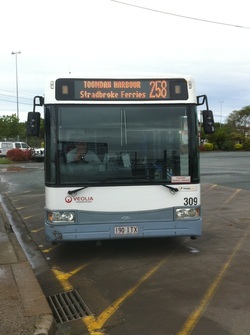 This bus goes directly to the "Fast" ferries water taxi terminal (see photo below). The train leaves from Central Station at 7.00am or Roma Street at approx 7.05am on the day of travel (please check local timetable). Any questions please ring 0409 123 586. Getting off the bus at the water taxi terminal. Stradbroke Fast Ferries leaves from this point. Muster at this point if you are coming by vehicle or you are hopping off the number 258 bus from Cleveland rail station. After the people disembark you will be prompted to board the vessel. You walk down the gang way and purchase your $20.00 return ticket/s on board from the ticket collector. 20 minutes later you will be stepping ashore and meeting me in Dunwich on North Stradbroke Island. Blue & White Stradbroke "Fast" ferries water taxi is the one we catch. This is the water taxi we need to be on. It runs to a very tight schedule therefore we ask you to be there 15 minutes before departure time as the boat leaves on those times. 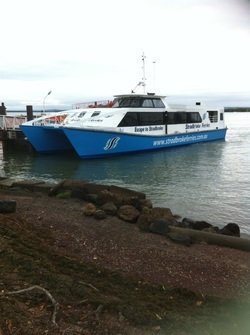 Click HERE to go to the Stradbroke Ferries web site for the latest timetable. Any questions please ring Dave on 0409 123 586. Leave your accommodation at 7.00am and get onto the M1 highway to Brisbane via Smith Street out of Surfers Paradise. 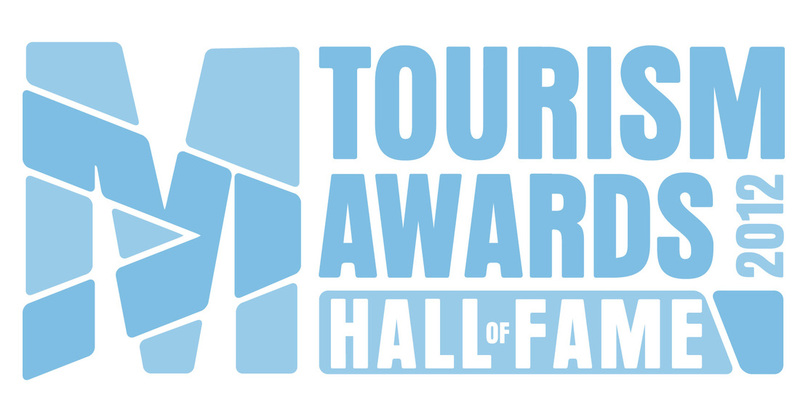 Travel along the highway until exit number 30 and this will take you all the way to the water taxi terminal in Cleveland at 3 Emmett Drive, Cleveland. Catch the 8.55am water taxi as shown in web page.